The Economic Development Coalition for Asheville-Buncombe County (EDC) and Industries for the Blind (IFB) announced today the awarding of an over $4 million federal contract that will bring 21 jobs to Buncombe County. IFB is a self-supporting not-for-profit organization that has won many prestigious awards over the years, most recently receiving national recognition for having the highest growth in jobs for the blind for an unprecedented five out of six years. This recent order for 145,000 poncho liners over a 6-month period will equal $4.7 million in new sales. “Industries for the Blind is proud to be a strong contributor to the Asheville community and economy,” stated Randy Buckner, Director of Asheville Operations. IFB achieves its success by offering a number of programs and services to the visually impaired community through A Brighter Path Foundation (meeting the needs of school age children to seniors), and Upward Mobility (promoting people who are blind into roles of increasing responsibility). These programs provide training, adaptive technology and equipment engineering to enable IFB employees and others in the community to progress to more complex and technical jobs. With locations in Asheville, Winston-Salem, and Puerto Rico, Industries for the Blind provides opportunities for persons who are blind or visually impaired in need of training, employment and services. IFB believes that all persons who are blind or visually impaired have the right to succeed in every area of life. 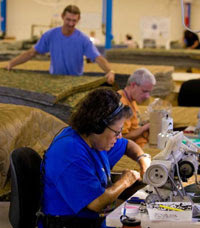 IFB is the largest employer of people who are blind or visually impaired in North Carolina and second in the nation with over 380 workers and fills annual contracts for labor and services valued in excess of $90 million. Today IFB has 37 blind or visually impaired employees in administrative and management positions compared to zero only five years ago. “85% of the people who are blind or visually impaired who work for us have never had a job before,” explained Buckner. In addition, IFB has not had to lay-off a single person who is blind or visually impaired in the past decade, and has never turned away persons who are blind or visually impaired seeking employment and willing to work. The EDC for Asheville-Buncombe County is a public-private partnership dedicated to the continuous improvement of the local and regional economy and well-being of its citizens. During the past five years, the EDC has been actively involved with projects with a cumulative investment of over $351,350,000 and project employment of over 2,683 persons. The EDC is funded by Buncombe County, the City of Asheville, and the Asheville Area Chamber of Commerce through the Advantage Asheville campaign. Eight Ball in the Corner Pocket! Friday, May 29th through Sunday, May 31st, 130 people on 18 teams in the American Poolplayers Association (APA) local pool league, will compete in the Blue Ridge APA Local Team Championship tournament at Fat Cat’s Billiards in Asheville (#2345 Hendersonville Hwy). The three winning teams from the greater Asheville area will advance to the APA National Team Championships at the Riviera Hotel & Casino in Las Vegas in August, where nearly $1 million in cash and prizes will be awarded. Members of Blue Ridge APA, the local pool league in Western NC, became eligible to compete in the local championship tournament by participating in weekly league play during this past year and placing tops in their division during the summer, fall or spring sessions. Last year, more than 1,300 North American teams comprised the APA 8-Ball and 9-Ball National Team Championships and the APA Masters Championship events. The APA, based in Lake Saint Louis, Mo., sanctions the world's largest amateur pool league, known as the APA Pool League throughout the United States and as the CPA Pool League in Canada and the JPA Pool League in Japan. More than 260,000 members compete in weekly 8-Ball and 9-Ball league play. The APA is recognized as the Governing Body of Amateur Pool, having established the official rules, championships, formats and handicap systems for the sport of amateur billiards. The APA produces three major tournaments each year – the APA National Team Championships, the APA National Singles Championships, and the U.S. Amateur Championship – that, together, pay out nearly $1.5 Million in cash and prizes annually. The APA is proudly sponsored by Cuetec Cues, Valley Tables, Valley Ultra Teflon Cloth, and Aramith Billiard Balls. For more information or to sign up with the Blue Ridge APA, contact Vicki Catalano at 828-329-8197 or email at blueridge@apaleagues.com or visit www.poolplayers.com. On Thursday, May 1, Presentations skills coach Rick Fornoff shared a short yet powerful course on improving your speaking skills here at the Chamber. The focus of the talk was on your elevator speech, that 30 second intro you give probably daily on your business. David Bonyan from the newly formed Asheville Video Productions was there and prepared this great four minute summary! Asheville, North Carolina 28801. The location was chosen by Matt’s record label, Still 7 Records, after label executive Dennis Kurtz learned about the venue being named a top club by Rolling Stone magazine. Orange Peel show patrons will be asked to wear summer attire—Stillwell encourages sundresses—to the show and can expect to sign a waiver if they are interested in appearing in the video footage. “Shine” was filmed at the inaugural “Stillwell Shine Fest” in Fontana Dam, North Carolina, and will bring country music back to the destination festival again June 19-20 of 2009. Visit stillwellshinefest.com for reservation and festival information. Tickets are still available to the general public for Stillwell’s show at The Orange Peel--$12 in advance and $15 at the door—and are available by visiting theorangepeel.net or by calling (866) 468-7630. For additional information or music on Stillwell, please visit mattstillwell.net. There has been a lot of talk lately about Asheville being recognized by Examiner.com as Beer City USA, a title we share with Portland, Oregon. Asheville has 9 operating breweries in the city and others right outside our doors in Black Mountain and other surrounding towns. Regardless of your thoughts on beer or alcohol, it is great to see Asheville craftsman recognized for their success, just like seeing a local musician or craftsman receiving recognition. An independent beer movement is brewing. Over the past month, more than 16,000 craft beer enthusiasts from 46 countries cast votes for “Beer City USA” in an online poll posted by founder of the American Homebrewers Association Charlie Papazian on Examiner.com. With roughly 30% of the votes each, the top honor of Beer City USA was ultimately split between two cities – Portland, Oregon on the west coast (an epicenter of American brew culture with more than 30 breweries) and, unexpected underdog, Asheville, North Carolina on the east coast (a smaller, but zealous, brew culture with more breweries per capita than any city in the U.S.). Hundreds of heated blog comments, campaigning via Twitter and Facebook, and multitude off-shoot blog posts fueled the best beer city debate in advance of American Craft Beer Week, May 11 – 17, a national celebration highlighting the culture and contributions of craft beer. Asheville has long been known for its stunning scenery, lively mountain music and famous attractions including Biltmore and the Blue Ridge Parkway. And now, it’s become the craft brewing center of the Southeast. With a population of just over 70,000, Asheville is giving bigger cities a beer-run for their money with seven diverse craft breweries (and two more well under construction). On any given day, about 50 local beers can be enjoyed, served on draft and in bottles. Asheville is also home to a world-renowned specialty beer store (Bruisin’ Ales, rated #3 retailer worldwide by RateBeer), three annual beer festivals (Brewgrass, Oktoberfest and Winter Warmer), and a wide selection of pubs, including the Thirsty Monk, with a downstairs tasting room featuring an all-Belgian lineup. A behind-the-scenes brewery tour, Asheville Brews Cruise offers an insider’s look with a designated driver of Asheville’s rapidly evolving brew culture. Blue Ridge Parkway officials are pleased to announce the opening of the Craggy Gardens Area to alternating one-lane traffic beginning on May 15, 2009. The Parkway detour between US 70 at Milepost 382.5 and NC Route 226 at Milepost 330.9/Gillespie Gap will be discontinued. However, retaining wall reconstruction will continue until the estimated completion in mid-June when this section of Parkway will be fully opened for two-lane visitor traffic. During daylight working hours, prior to mid-June, visitors should expect one-lane traffic, to include traffic control by flagmen or traffic light, in the area of the retaining wall reconstruction south of the Craggy Gardens Visitor Center. A timed traffic light system will be in operation for night-time travelers passing through the one-lane closure. Craggy Gardens Visitor Center is scheduled to open May 15th for the remainder of the 2009 visitor season. Visitor center parking may be limited to one parking lot area until mid-June and at various times during Parkway road reconstruction. All visitors, in particular motorcyclists and bicyclists, should travel through the area with extreme caution because of loose gravel and rough pavement conditions existing along the entire route. 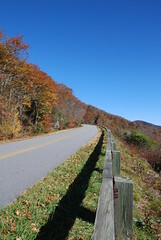 In addition, re-paving operations will commence on the Parkway between Asheville and Craggy Gardens and continue through the 2009 visitor season. Parkway officials caution visitors traveling though this area to pay close attention to traffic control by flagmen as slight travel delays may occur in the re-paving zones. American Security Shredding, Asheville, N.C., has acquired Carolina Shredding, another Asheville document destruction firm. With the acquisition American Security Shredding will be able to service customers throughout western North Carolina and parts of Tennessee. The acquisition is the first for American Security Shredding. In addition to the North Carolina plant, American Security Shredding has a facility in Gainseville, Ga., that services customers throughout Northern Georgia. "This is a great opportunity for us to nearly double our operations and to continue our growth in Western North Carolina. We have always had a great respect for Carolina Shredding, and are confident we will provide their current customers with the outstanding service they have grown accustomed to. I feel that being local, staying in good relationships with all of our customers, and providing unmatched customer service is the key to our success," said Wes Boyd, president of American Security Shredding. The acquisition will allow the company to provide both on-site and off-site services at both locations. Received the press release this morning on the Holiday Inn Biltmore Square renovations. Looks nice! Asheville, NC (Grassroots Newswire) 05/05/09 -- South Asheville Hotel Associates today announced that it has completed a renovation of Hampton Inn Biltmore Square located at 1 Rocky Ridge Road in Asheville, NC. "This renovation demonstrates our commitment to providing guests with the most up-to-date and high quality accommodations they’ve come to expect during their travels," said Barbara Kish, general manager. 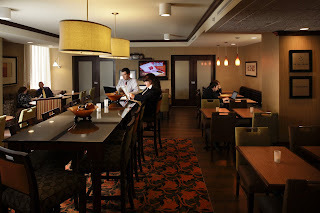 "When travelers visit Hampton Inn Biltmore Square they will continue to find the friendly service and value-added amenities synonymous with the Hampton name, all backed by our 100% Hampton Satisfaction Guarantee." As part of the renovation, improvements were made to the Entire Hotel totaling 3.5 Million Dollars including our luxurious contemporary guestrooms which include upgraded Eco-Friendly furnishings and LED lighting, American built furnishings, high-tech P-Tac comfort systems and new 32" LCD HD flat panel televisions. 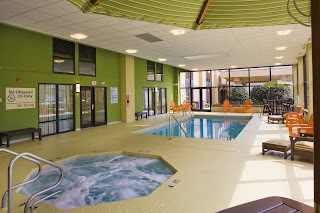 Relax and refresh in our modernized indoor pool, whirlpool spa and fitness area featuring all Eco-Friendly furnishings. Our Fitness area includes all new state of the art Precor equipment and a low impact floor. The 5-story, 120-room Hampton Inn is near such area attractions as the Biltmore Estate and Winery, NC Arboretum, the Blue Ridge Parkway, WNC Farmer's Market, Chimney Rock State Park, the Folk Art Center and the Historic Biltmore Village minutes from Downtown Asheville . Standard hotel amenities include Complimentary On the House Hot Breakfast, On the Run Breakfast Bags, Coffee and Tea service, 24 hours each day, USA Today( Monday-Friday), Fax and Copy Service 24 Hours daily, Same day Dry Cleaning and Laundry Service Monday - Friday. Guestrooms are equipped with Cloud Nine, the Hampton Bed experience, 32" LCD HD flat panel televisions, alarm clock radios, work desks with adjustable chairs, coffee makers, hairdryers, LED lighting and P-TAC comfort systems. 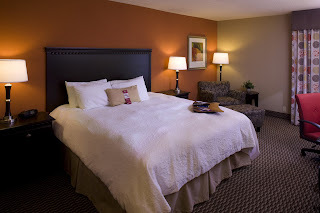 For further information or to make reservations for the Hampton Inn Biltmore Square, please visit www.hampton.com or call 1-828-667-2022 or 1-800-HAMPTON. A virtual tour of one of our members, the Diana Wortham Theatre, done by another another Chamber member, Ed Holmes & Associates Land Surveyors, PA. Very cool stuff! Dixon Hughes is a regional CPA firm with headquarters here in Asheville. They are expanding their Florida presence. No new jobs here in Asheville but it is always good to see a local company grow! Jacksonville, FL, April 29, 2009 - Southeast super-regional CPA firm Dixon Hughes PLLC announced today that it would integrate the practice of Jacksonville-based Presser, Lahnen & Edelman effective June 1. About Dixon Hughes: Ranking among the nation's top 20 CPA firms, Dixon Hughes is the largest CPA and advisory firm headquartered in the Southeast. The firm provides a wide array of assurance, tax and consulting services to clients of all sizes in a variety of industries.